Tervetuloa joulukuun Penny Black and More haasteen pariin. Helppo haaste kiireiseen vuodenvaihteeseen: Kaikki leimattu käy! Tein samalla kolme korttia! Hello, Happy 98th Independance Day Finland! First Sunday of the month - it's time for new Penny Black and More December Challenge. Easy peacy theme for Christmas time: " Anything Stamped Goes" But remember the stamped image is in the main roll. Here's my 3 Christmas cards! Stamp: Penny Black: "Xmas Crafts 2747K"
Die cuts: shapes Sizzix; snowflake Memorybox, wax paper cut Spellbinders. 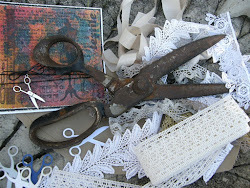 Silver tape, lace; stamped text "Merry Christmas". 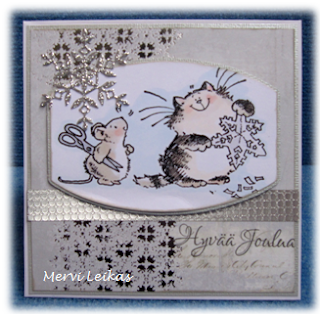 I really like your choice of soft colours Mervi together with the added die cuts which really draw the eye. So very cute!! Think I need to add this stamp to my stamp collection. Love the colors you used here and fantastic sketch! Adorable cards, love those big snowflakes! 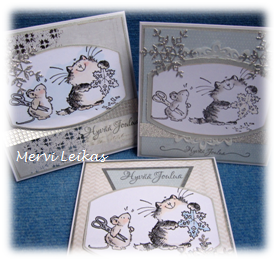 Three fabulous cards Mervi, lovely image and great colours. 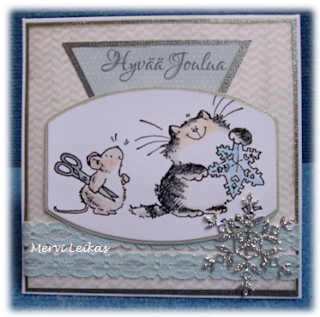 Cute image and beautifully sparkly snowflakes, three great designs! aww, these are so cute! both critters getting into holiday paper crafting makes me smile. Three beautiful cards Mervi all perfectly laid out. I love the blue and grey colour combination too. Very beautiful card. Thank you for sharing with us. These are gorgeous, so cute and I love the designs. Lovely cards, that image is so cute and your soft shading makes for beautiful cards. I love all the versions you made! The muted colors are very vintage! Three super cards! Love the image and how your have embellished each one.